New at Pine Haven Cafe: Thursday lunch buffet! We already know that Upland’s Pine Haven Cafe has a delicious (and, at $7.99, reasonably priced!) Sunday breakfast buffet. Last week, the restaurant added a new weekly special — a Thursday lunch buffet! The buffet, which runs from 11 a.m to 2 p.m., is $9.95. Buffet choices will vary from week to week. Today’s (February 28) buffet features a Parisian salad, Burgundy beef, jasmine rice, soup and a dessert. Pine Haven Cafe is at 1191 E. Foothill Blvd., at the GuestHouse Hotel and Suites. For updates, follow Pine Haven on Facebook. BJ’s Restaurant and Brewhouse is taking reservations for a beer pairing dinner featuring traditional English ales. The dinner will also feature the restaurant’s latest limited edition brew, BJ’s Brewmaster’s Reserve Imperial Red Ale. The five-course dinner costs $30 and all participants must be 21 years of age or older, obviously. Beers featured in the dinner include Boddington’s Ale, Newcastle Brown Ale, Old Speckled Hen, Newcastle Founders’ Ale, Samuel Smith Taddy Porter, BJ’s Brewmaster’s Reserve Imperial Red Ale, Samuel Smith Organic Chocolate Stout and BJ’s P.M. Porter. Inland Empire BJ’s locations include Rancho Cucamonga, San Bernardino, Chino Hills, Moreno Valley, Corona, Menifee and Temecula. Date of the dinner varies depending on location. Head over the jump for dates. Award-winning pizzeria A.J. 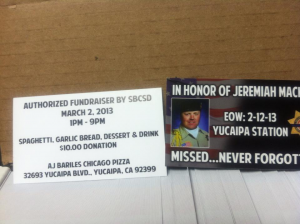 Barile’s Chicago Pizza is hosting several fundraisers for the family of San Bernardino County sheriff’s Detective Jeremiah MacKay, who recently died in the line of duty. One has already begun. Now through March 31, for every medium and extra large pizza purchased, $2 will be donated to MacKay’s family. Also, 10 donated cases of MacKay’s favorite beer, Guinness Black Lager, are being sold at $3 per bottle. All sales will go to MacKay’s family. From 1 to 9 p.m. on Saturday (March 2), the restaurant is hosting a spaghetti dinner. California Pizza Kitchen is hosting a fundraiser this week for the families of two Inland Empire officers — Riverside Police Department’s Officer Michael Crain and San Bernardino County sheriff’s Detective Jeremiah MacKay — that were recently killed in the line of duty. The chain is will donate 20% of guests’ checks to the Riverside Police Officers’ Association and the Sheriff’s Employee Assistance Team on behalf of their families when this flier is presented. The fundraiser is happening today (February 25) through Thursday (February 28) at all California CPK locations. The flier is accepted during all business hours on both dine-in and take-out orders, catering and curbside service. It’s even good on alcoholic beverages, so if you want to raise a glass, you can, and help support the cause at the same time. 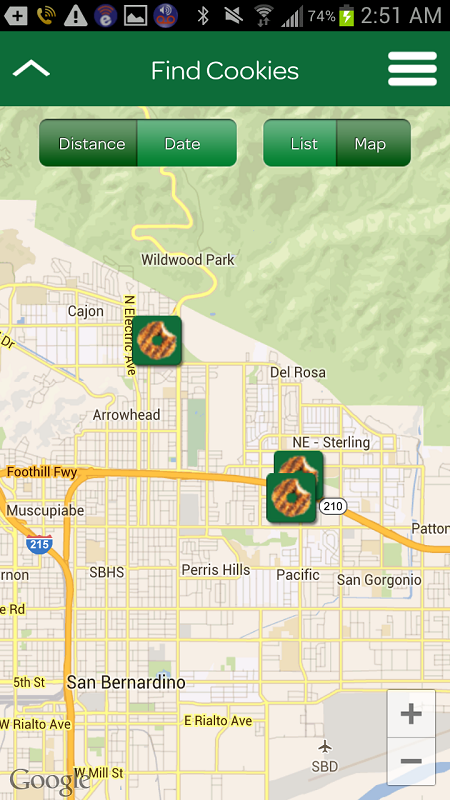 Inland Empire CPK locations include Rancho Cucamonga, Chino Hills, Riverside, Temecula, Palm Springs and Palm Desert. Our friends over at IEShineOn.com are putting together a sweet event that will help support two organizations. 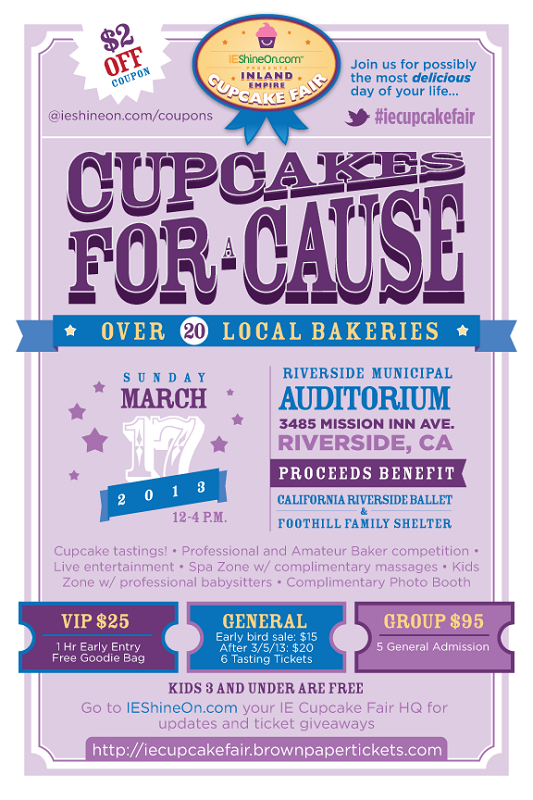 The Inland Empire Cupcake Fair will take place from noon to 4 p.m. Sunday, March 17, at the Riverside Municipal Auditorium, 3485 Mission Inn Ave.
Really, who doesn’t like cupcakes? 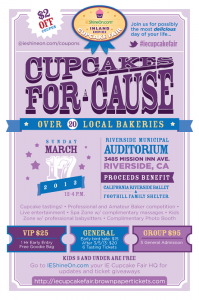 Amateur and professional bakers are encouraged to compete in their respective categories, which will be judged by a panel of celebrity judges, including yours truly. Oh, remember a while back, when we reported that Fairplex’s Thursday food truck gatherings were going dormant until April? Well, food truck fans can rejoice, because they’re back this week! The trucks will be parked from 5:30 to 8:30 p.m. in the lower administration parking lot in front of the Wally Parks NHRA Motorsports Museum. Head over the jump to see who’s scheduled to be there tomorrow (February 21). Redlands’ Hangar 24 Craft Brewery has set a date for its fifth anniversary — Saturday, May 18! This year also marks the inclusion of the brewery’s inaugural Airfest to the annual celebration. The day will be filled with archive brews and special releases, aerial acts, live music and great food. A night air show with fireworks is also planned. Doors will open for the event at 9 a.m., with last call at 9 p.m., at the Redlands Municipal Airport West Ramp, right across the street from Hangar 24 Craft Brewery. Seeking Girl Scout Cookies? There’s an app for that! It’s Girl Scout Cookie time again! If none of your co-workers or family members have girls in the Girl Scouts, you might find it a little tricky to track down Girl Scout Cookies. Not if you have a smartphone. There are a pair of apps — each available for iOS and Android — that allow you to search and find Girl Scout Cookie sales in your area. One, from Kellogg’s, does a reasonable job of letting you know where the sales are by date and location. The other, from the Girl Scouts themselves, is a little more robust. 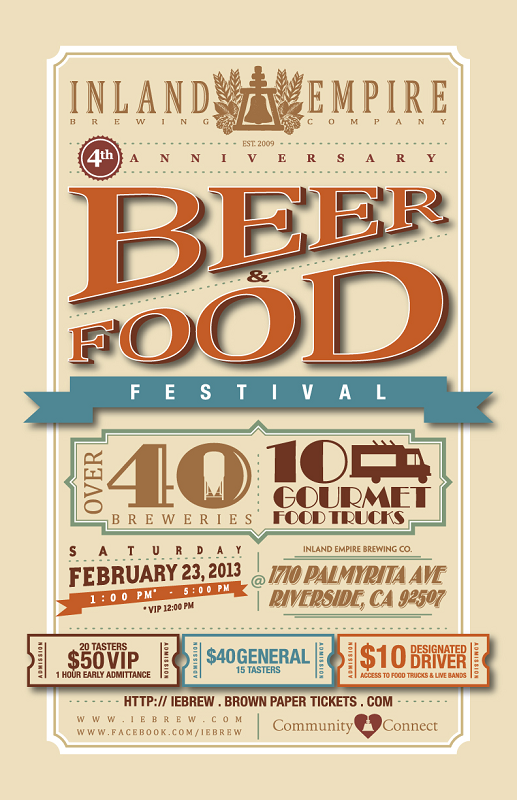 Riverside’s Inland Empire Brewing Company is celebrating its fourth anniversary Saturday (February 23) in a big, big way. Let’s start with the numbers. 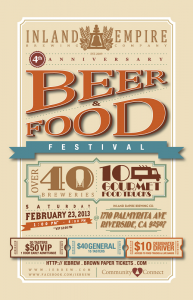 A staggering 26 Inland Empire brewers will be represented at the event. Add to that a baker’s dozen of brewers from outside the I.E. And on top of that, add ten food trucks and four bands. What do you get? One heck of a party! Two days before Valentine’s Day and you haven’t made reservations yet? Head over the jump to find local Valentine’s Day specials for all budgets.